One of the best things about Blogging Conferences is connecting with brands, and BlogHer will always win for sheer volume and variety that's a given, they do it bigger! But for me when I can finally connect with a brand that I already love and really use on the regular it's a win/win. Their range is super diverse and it was during BlogHer15 that I discovered in addition to the hair and body care products that I have grown to love, they make makeup/cosmetics as well. I got my makeup done, and I discovered that I still need more practice in the fine art of contouring but I loved the products that were used on me and I also waited to get my hair done. The hairstylist took one look at my hair and said my ends 'were a hot mess' (they were) and told me to return the next day so he could trim them. And I got my first ever haircut (not just a blow out, flat iron or hair touch up) on a tradeshow floor, that was a first for me! And I have to say I absolutely LOVED the results! I have fine hair so if I over product it can look greasy at the root but the ends will still look dry because it's also frizz prone. I have to be careful not to let my hair 'bulk up' too much and when I get a quality cut I can feel the difference, I have fine hair but a lot of of it, so after it's well cut, my whole head sort of feels 'lighter' and of course feels smoother and silkier (no matter how hard I try I have never been able to replicate a hair stylist blow out at home!). Their booth was buzzing, of course because the products are really THAT good, but they also had a live Graffiti Artist doing wall art for them at the booth, the mural was created by Seb Gorey and you can read more about the mural that was created HERE. I left that booth feeling like a million bucks, or at least like a shinier penny that's for sure! Makeup CHECK. Hair cut and styled, CHECK. Samples of my favorite products, CHECK PLUS PLUS. Shh! Don't tell anyone but theirs was my favorite booth at BlogHer15. They were super welcoming, took the time to LISTEN not just try and sell, and their hair and makeup artist were totally on fleek. You know I only pause for mascot photos and avoid direct on photos of myself where possible (you all know I don't fall for 'step and repeats'), so for me to pose by myself with no mascot in site is total brand love! And while it's a small thank you in comparison for how good they made me feel, I hope they know just how much this particular blogger feels appreciative of the efforts they took into keeping up that energy and working hard to make sure everyone left their booth feeling beautiful. The hooded cardigan and top I am wearing are by MiracleSuit and the jeans are by Silver Jeans! I want to add that Shea Moisture body scrubs are the BOMB, and I can't stress enough that their hair care products are good for ALL hair types! 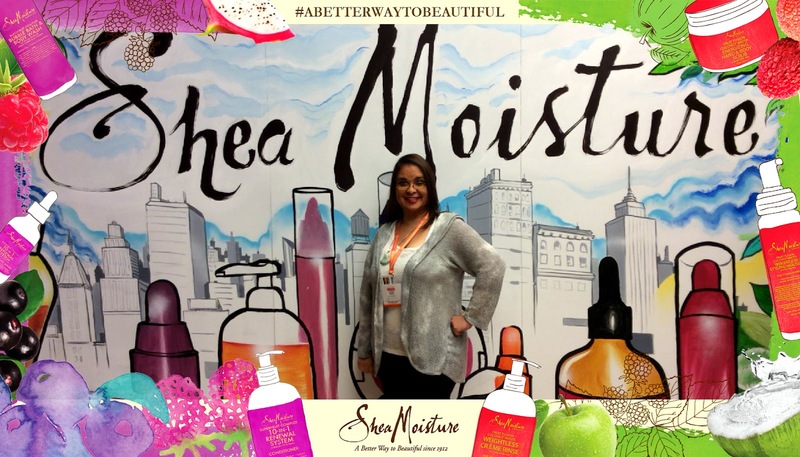 Have you tried Shea Moisture Products yet? If so, which is your fave? What is your go to haircare brand? FTC Disclosure: This is a NON -compensated post, no monetary compensation has been received and this is an event recap (samples were provided). All my opinions are 100% MY OWN. I was a Vitabath Brand Ambassador for the BlogHer 2015 Conference. I am disclosing this in accordance with the Federal Trade Commission 16 CFR, Part 255 - Guides Concerning the use of endorsements and testimonials in advertising, you may check our Giveaway and Disclosure Page for additional information regarding Ascending Butterfly Disclosure. I've never heard of Shea Moisture until today. I like trying out new skin care products, so I will check this out. Their body scrubs sound interesting, too. I have heard of Shea Moisture and I have seen them on store shelves too, however, I have not tried any of them yet. I will make sure I get some of their hair products the next time I shop. I think my girlfriend uses that stuff. I'll have to send this to her just to be sure, though. She's always looking for new beautification anything. I had not heard of them until today but I am always looking for ways to keep my skin soft and moisturized. I will have to check them out! Had never heard of SheaMoisture until now either. Their pdocuts sound fab. I'm Always glad when people genuinely listen and don't just try to sell their products. I haven't heard of their products before, but it sounds like an amazing line! I'm always on the lookout for products that are great quality and kind to my skin and hair! I use Shea Moisture products ,it's good to see that more people are getting to know about them ! Awesome that you can attend #BlogHer! I've been wanting to but to no avail. :( Anyway, my husband loves shea too, I can't tell the difference honestly besides the smell. LOL. I love shea products but I don't think I've used this exact brand. I will have to chec it out. Love learning about new beauty products, these sound like some great ones that I will have to try. thanks! She Moisture sounds great! I would love this for the upcoming winter. I have tried it a few times, and always been so impressed. Even though summer is over, moisture is still so important to my skin. I love going to the booths at conferences! They are so generous and I learn so much. I would've loved to go to a Shea Moisture booth! I love their products for curly hair! This brand looks great. I am a huge lover of Shea stuff. It'll be hard to keep it a secret! You look fabulous. I've never had a haircut at a conference either. Things to look forward to! I swear by their hair products for myself and my daughter. They've never let me down. Awesome to know your personal favorite at BlogHer. For sure what they offer are truly interesting. OMG - I used Shea Moisture for the first time a few weeks ago and fell in love. Every time I read one of your posts about BlogHer, it makes we really want to go next year. How fabulous that you can support a brand you already knew and loved like this! I'm glad you were able to connect with them. I haven't tried Shea products yet. I'm glad you found a new favorite at Blogher. I would love to go to a conference like this one day. UI used a lotuon with shea butter but not moisturizer. Now you got me curious, I will for sure look for one. I so wish I could have attended BlogHer. I have never tried this company but I love taking care of myself so I will check them out. I have never heard of Shea moisture products but they sound amazing! I would love to give them a try! I have seen the Shea Moisture products as Target but never tried them!! Looks like I need to no!! I've never heard of this product...but I'll take your word for it that it's amazing! I was aware that this line did hair products, but had no clue that they did makeup and cosmetics too. I've always looked at their packaging, and have been attracted to the sophisticated look of the design. The idea to incorporate the graffiti booth is so clever - love it! I have never been brave enough to get my hair done at a conference. I'm glad you liked yours. Shea Moisture is one of my absolute favorite product lines. I use it on my daughter's hair and it works wonders.